History – All Things AAFS! Archaeologists Discover Tomb of Moche Priestess-Queen. 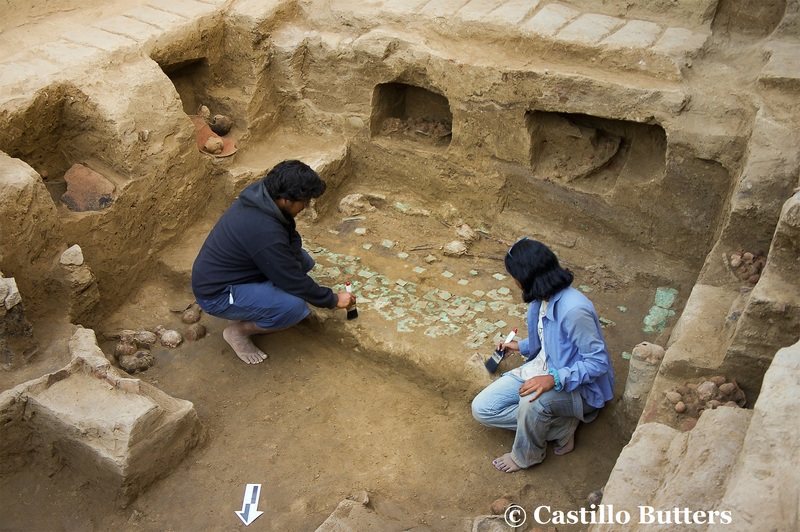 The archaeologists, led by Luis Jaime Castillo Butters, discovered the tomb within the excavation site situated in San José de Moro, in the Jequetepeque River valley of northern Peru. The tomb belongs to what is believed to be a powerful Moche Priestess-Queen, who was buried 1,200 years ago and is thought to have been a prominent figure in Moche civilisation. The tomb of the Moche Priestess-Queen, which was discovered six metres underground in San José de Moro. The tomb consisted of a large chamber situated twenty feet underground and the large earthen walls of the tomb were painted red. The Priestess-Queen was found at one end of the chamber and resting on a low platform with a simple bead necklace, consisting of local stones, adoring her neck. Two adult skeletons were also found alongside the Priestess-Queen, who have been presumed to be sacrificed female attendants and five children were also buried in the tomb. The most important clue that identified the female skeleton as a powerful Moche Priestess-Queen was a tall silver goblet that was found placed next to the skeleton. These silver goblets have been seen in numerous Moche art pieces, depicting scenes of human sacrifice and blood consumption. Other similar goblets were previously found in tombs of other Priestess-Queens. Another clue to the female’s identity as an important person was the coffin itself. The coffin is assumed to have been made out of wood or cane, as it has decayed over the many centuries leaving only the copper plaques that covered it. The plaques trace out a typical Moche design, consisting of waves and steps, which now lay beside the skeleton where the wall of the coffin collapsed. Near the head of the skeleton was a copper funerary mask, which is thought to have been arranged on top of the coffin at the time of burial, and by the foot of the coffin were two pieces of copper shaped like sandals. Castillo Butters explains that “the coffin was anthropomorphised so that it became a person”. 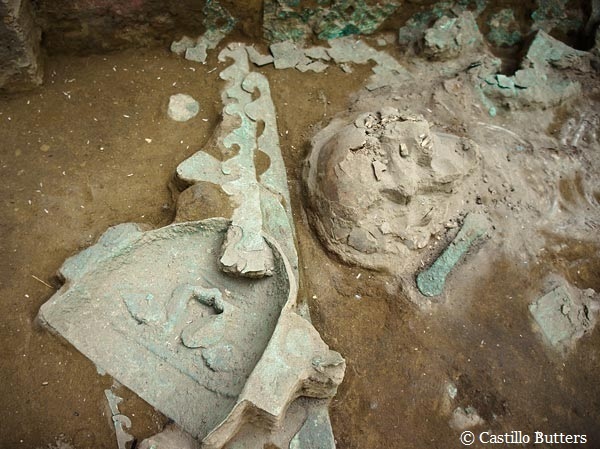 The funerary mask discovered next to the Moche Priestess-Queen, who’s skeleton can be seen in the background. Click here to read about the Llullaillco Maiden, a 500yr old Inca child mummy, who was recently discovered to have been drugged before being sacrificed for the Incan ritual of Capacocha.